Hjem » Sol & Solarium » Solariumskrem flasker » Affection 20X Black Bronzer 250 ml. 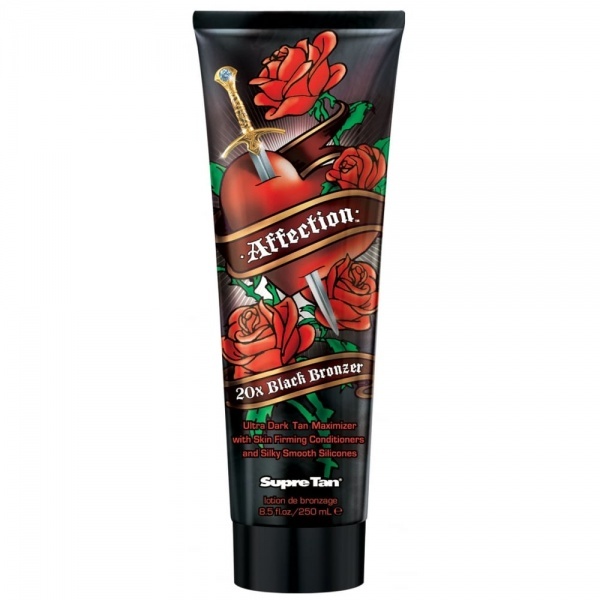 Affection 20X Black Bronzer by Supre is an ultra advanced 20x Black Bronzing Blend of DHA and Natural Bronzers that will dramatically darken skin after UV exposure for a deeper, darker longer lasting tan. Powerful dark tanning maximizers help boost melanin production during UV exposure for a deep rich golden tan. Skin Firming Trace Mineral Complex contains Vitamins and Antioxidants to help nourish, rejuvenate, condition and help protect skin against environmental stress to help reduce appearance of fine lines and wrinkles. 4-Part Silicone blend balances moisture and leaves skin feeling noticeably soft, silky and smooth. Spatler for ansikt i tre - 100 stk.